Shortly after I opened up my Evernote account in 2011, I realized it could be a powerful tool for capturing, indexing and retrieving sermon illustrations. Here’s how I do it. First, I use Google Chrome’s Evernote web clipper to capture articles, pictures, or anything think I would serve as a fitting illustration for a particular point or Scripture passage. Evernote also has apps for iPhone, iPad and other devices, so you don’t need to be at your computer to snag an illustration. Sometimes I enter a note manually if it’s from a book I’m reading. You could even take a picture of the page and enter it that way, if you don’t want to take the time to type it out. If the text is clear enough, Evernote will actually be able to recognize and include that text in a search. After pulling the note or resource into Evernote, I tag it. When choosing which words to tag the note with, I ask myself,”If I needed this resource to illustrate a point or Scripture passage, which words might I search to find it?” I enter the several most relevant words I can think of. Obviously, if it’s a Scripture passage, you would want to tag it with a Scripture reference in addition to other words. It’s important to tag the notes well if you want the right illustrations to come up when you do a search. Then when I want to search for an illustration, I simply select my “Sermon Illustrations” notebook, and type a keyword into the search bar. EXAMPLE ONE: I was preparing a sermon on Philippians 4:2-3. In my study of the passage, it seemed apparent that Euodia and Syntyche had once formed part of powerful gospel team. However, the conflict between them had derailed their effectiveness. Instead of working to advance the gospel, they were fighting with each other. I wanted to give an illustration of someone who lost effectiveness because they were fighting the wrong battle. I came across an illustration from the sports arena: 2009 Super Bowl MVP Santonio Holmes Jr. gained notoriety for criticizing his teammates’ performance to the media. It had been a growing habit with Holmes, so much so that it was said that he “had a habit of doing more running with his mouth than with the ball.” In one important game, he even started to pick a fight in a team huddle. When Holmes should have been concentrating his efforts against his opponents, he was instead ripping into his own teammates. The offensive coordinator had enough. He pulled Holmes from the game. The entire New York Jets team was embarrassed, especially their team captain—Santonio Holmes. Holmes had damaged his team’s morale and compromised their unity. Although I had to search for the illustration online, I used Evernote to capture, store, and index it. 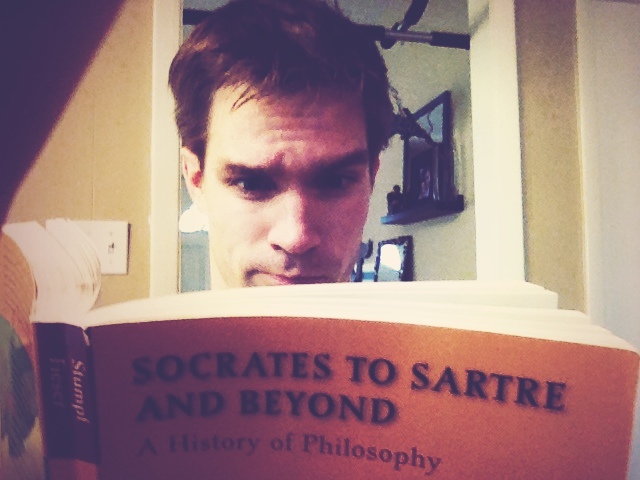 EXAMPLE TWO: I was reading a book recently–Socrates to Sartre and Beyond: A History of Philosophy. I came across a description of Socrates’ dialectic method. Using this method, Socrates “pretends to be ignorant about a subject and then tries to draw out from other people their fullest possible knowledge about it. His assumption was that by progressively correcting incomplete or inaccurate notions, he could coax the truth out of anyone. He would often expose contradictions lurking beneath the other person’s views–a technique called elenchus–and thereby force the person to abandon his or her misdirected opinion” (p. 34). 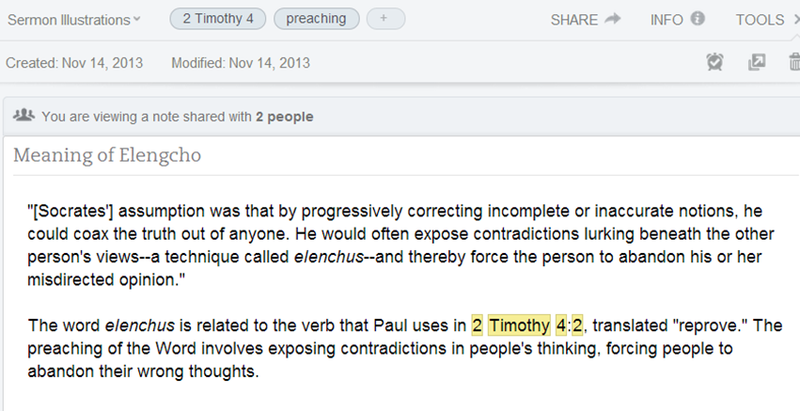 I thought that would nicely fill out one’s understanding of that word if I ever teach or preach on this passage. So I created the note you see below. As you can see, I included only two tags, “2 Timothy 4” and “preaching.” These were all the relevant words I could think of. Here are a few important (probably self-evident) considerations that would inform any approach to storing and indexing sermon illustrations. 1. Keep it stocked. Like a food pantry, a sermon illustration database is only as useful as you keep it stocked. It’s one thing to have a really cool way of capturing ideas and illustrations. But it takes time to build it into something useful. Expect this reap significant benefits after several months at the earliest. 2. Be purposeful in what you include. It’s just as important to know what to keep out as it is what to keep in. With internet search engines, you can always access information on any topic. Our problem is not so much getting information, but wading through all the stuff we don’t need. Don’t give into the temptation of making your sermon illustration database another Google. 3. Be constantly on the prowl for good illustrations. You have to get into a mindset of looking for snippets that illuminate Biblical truths or passages. 4. Know your Bible well. The better you know the Bible, the more you will be able to connect anecdotes, statistics, news articles, etc. with Scriptural truths. Finally, one more aspect that can exponentially increase the usefulness of this tool: you can share notebooks with others. If you and other pastor or ministry friends decide to collaborate on capturing and indexing sermon illustrations, you can develop a really powerful resource. 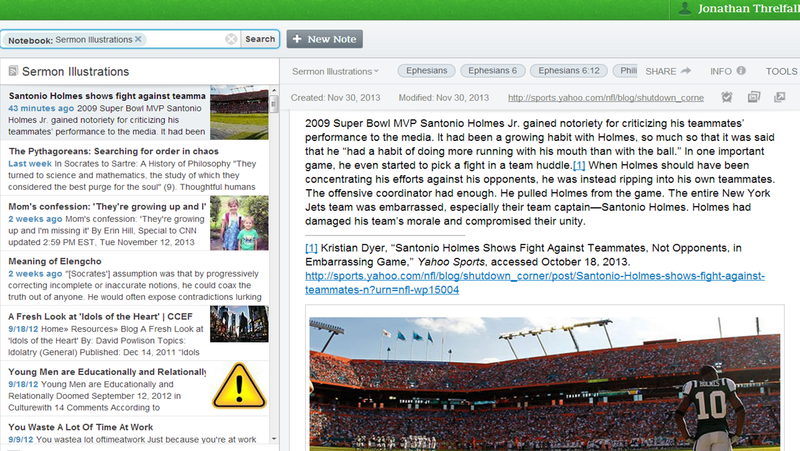 Do you use Evernote to index sermon illustrations? What methods have worked for you? What else do you use Evernote for? Share by commenting below. Now this is useful. Thanks! I guess someday I really must get an evernote account… as much as I’m weary of creating one more online account with one more password to manage. But this might push me over the edge. So far, I have a little folder in my Zotero for sermon illustrations, but I don’t really use it that much. If you end up using Evernote for indexing sermon illustrations/resources, let me know how it works for you. Maybe we could link up accounts. Only problem is that Socrates is at the least effective 3rd level (“learned/learned”) level of illustrations for most people. The time to explain this level usually results in a bruising baseball bat effect instead of a rapier thrust. This commonly results in audiences who only remember great stories and no truth!